The automotive software market report 2019-2025 explores the essential factors of the market considering such as industry situations, market demands, market players adopted business strategies and their growth scenario. The autonomous driving software segment in the automotive software market is projected to register an accelerated growth during the forecast timeline growing at a CAGR of around 17%. The growth is attributed to investments and R&D activities done by companies such as Bosch Software, Wipro, and NVIDIA. In addition, these companies are also taking efforts to expand and emerge with other companies to design & develop autonomous vehicles. The mobility service segment in automotive software market is anticipated to exhibit a lucrative growth at a CAGR of over 19% between 2019 and 2025. The increasing adoption of Mobility-as-a-Service (MaaS) is expected to influence the mobility service application market significantly. In addition, companies such as General Motors, Ford, and Delphi are taking their leap into this market by making huge investments to develop fully-automated cars, which may further explain the growth of this segment. 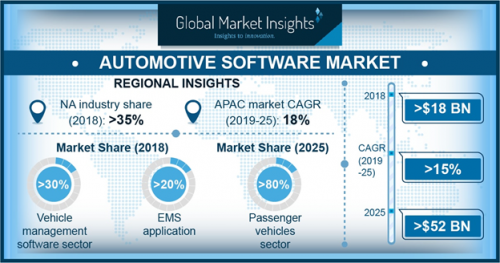 The passenger vehicles segment shows a promising growth rate in the automotive software market during the forecast period. This segment has a wide area of application for automotive software as compared to commercial vehicles. Passenger vehicles with various in-vehicle electronics systems, such as power steering, powertrain, and start-stop systems, contain numerous ECUs that need software programs to work. The trend of integrating smart technologies in passenger vehicles is increasing the number of in-vehicle electronics systems, increasing the number of ECUs, expanding the opportunities for automotive software in the passenger vehicles segment. The manufacturer retail store segment in the automotive software market shows the highest growth rate during the forecast period. This segment is influenced by the increasing consumer expectations and dealership franchise dynamics. In addition, the increasing vehicle pricing transparency and consumers, who are equipped to make product comparisons easily are affecting the profit margins of dealers significantly. Therefore, offering the range of automotive software solutions in terms of customization may cure the decreasing profit margins of automotive dealers up to a certain level.